A three-point basket with 21 seconds left on the clock was just enough for the Cougars of Spring Arbor as they edged out the Maple Leafs 51-50 last Saturday afternoon. Goshen jumped out to an early first quarter lead behind five three pointers from four different starters. The balanced scoring attack ballooned their lead to a game-high 11 points before Ali Gerka beat the buzzer with a three for the Cougars. This proved to be an important score for Spring Arbor as they carried the momentum into the second quarter. The Cougar defense flipped a switch in the second quarter, turning the Goshen offense over eight times and holding them to a mere five points. After an opening basket from GC sophomore Logan Kyre, the Cougars went on a 15-3 run including nine points from behind the arc. The Leafs compounded their poor offensive quarter by committing seven fouls. A short bench made things difficult, but they fought into the half down 29-27. Halftime adjustments transformed the Goshen offense as the Maple Leafs looked to pound the ball inside to first-year Taniece Chapman. The alteration proved effective as Chapman scored eight of her team-high 15 points in the third quarter, giving the Maple Leafs a 40-37 lead heading into the fourth quarter. Chapman continued to roll as she scored on the first possession of the fourth quarter. Senior Haley Archibeque followed by draining a three, stretching the lead to eight with eight minutes to go. 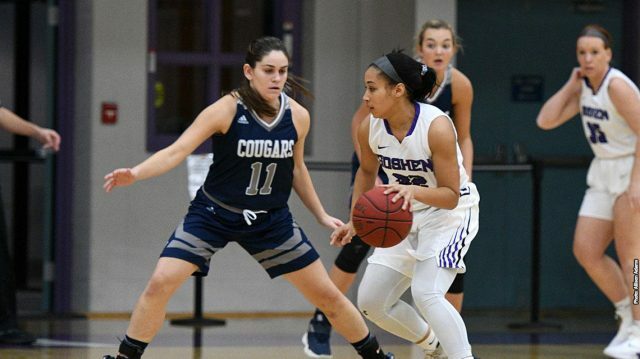 Down the stretch, the Cougars went to their two leading scorers Gracie Cabana and Rachel Nelson to bring the game back within two with two minutes remaining. Goshen had three shots on the other end to separate themselves, but were unable to convert off the two offensive rebounds. With just 21 seconds, the Cougar offense found Cabana once again for a three to put Spring Arbor up by one, 51-50. Goshen then ran the clock down to 11 seconds before calling a timeout to draw up the final possession of the game. Senior Caitlyn O’Neal had a good look at a three with eight seconds left, but could not connect. However, Chapman grabbed the offensive rebound and put up a second shot before drawing a foul on a third attempt. With two seconds remaining, the free throws didn’t drop for the Leafs and after one final offensive putback, the game was over. The final score was Cougars 51, Maple Leafs 50. Goshen was lead by Chapman’s 15 and 15 double-double. Sophomore Mariah Roe added 13 points and three rebounds. Archibeque rounded out the scoring with six points, four rebounds and three steals. With the loss, the Maple Leafs drop to 7-15 on the year. Goshen travels to Marian University for their next matchup on Jan. 26, as they take on the eigth ranked Knights.